The Royal Horticultural Society (RHS) is a big deal in the UK. It’s the largest non-profit gardening organization in a nation obsessed with gardening, and does everything from running the Chelsea Flower Show to promoting nation-wide gardening campaigns. And it’s as royal as it sounds – half the board of directors seems to have some sort of knighthood or royal title. 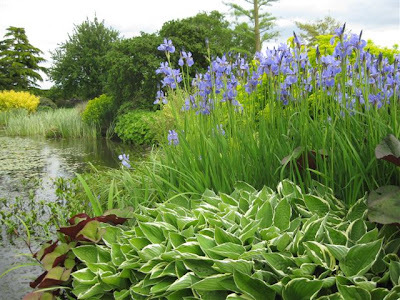 Among the many things the RHS does is maintaining four large public gardens spread across the UK: Wisley, Rosemoor, Harlow Carr, and Hyde Hall. 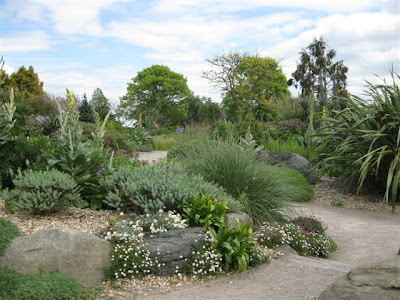 Hyde Hall is the relative teenager of the group, having been gifted to the RHS only in 1993 (compared to Wisley, which has been an RHS garden since 1903). As a result, Hyde Hall is still a work in progress with the requisite growing pains. The challenge at Hyde Hall is that it is built on the framework established by the previous owners, Dr. and Mrs. Anderson. Mrs. Anderson was a keen gardener, but not a designer. When she arrived at Hyde Hall, the area around the house was a dumping ground for rubble, and the surrounding land had been a working farm for hundreds of years. Mrs. Anderson set to work enthusiastically, cleared the rubbish and bramble, planted over 60 trees and defined herbaceous borders and vegetable plots. While the results are pleasing enough in a traditional English garden sense, they are somewhat unspectacular in the context of the present garden. Using a 1955 layout conceived by an amateur gardener is rather limiting if your aim is to develop an innovative, modern public garden. However, Hyde Hall has a lot of room to grow, and I did find that the new areas the RHS has been developing are extremely well done, boding well for the future of the garden. The best thing the RHS has done is embrace the character of Hyde Hall and develop new gardens with this in mind. 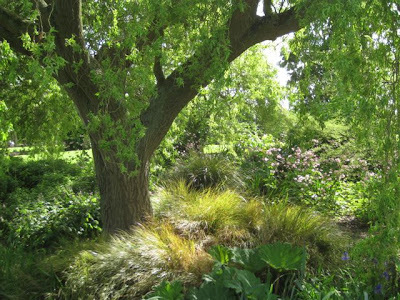 Hyde Hall is defined by its location: an exposed, hilly site, with strong winds, poor sticky clay soil, cold winters and the lowest rainfall in the UK. Appropriately, the centerpiece of the current garden is the limestone rock garden. Planted in 2001, it already looks fully mature, and both the design and the plantings fit the site perfectly. For once, this is a rock garden in a spot where one is completely appropriate. The bolders are large enough to make an impact, and so are the plants. They aren’t the usual tiny rock garden plants carefully set one foot apart in a gravel bed and requiring a magnifying glass to see. 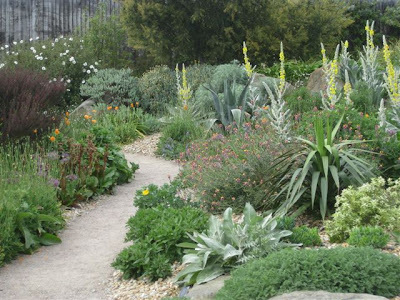 They're big grasses from all over the world, bold yuccas, stately self-seeded verbascum and incredibly orange California poppies. The garden isn’t artificially irrigated or otherwise babied along. 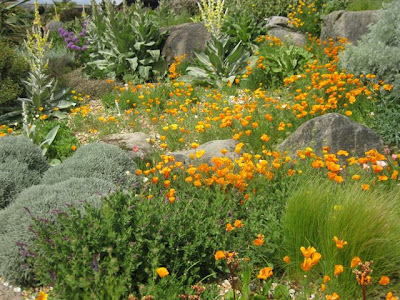 This is a great example of a rock garden that actually works. The even newer parts of the garden are works in progress. A new visitor center is just opening along with a huge parking lot (not exactly an attractive addition but a needed improvement over the current, steeply sloped lot which can be tricky in a manual car). The new gardens embrace a naturalistic approach around the hilly site, and many are already growing well. 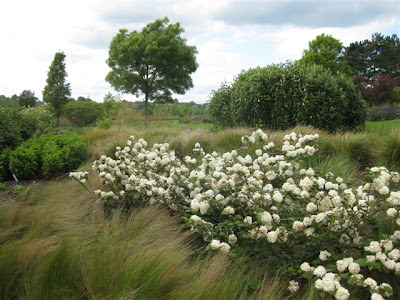 In one area I spotted this great combination of breezy Stipa grasses with a flowering shrub, which I believe was a viburnum though I didn’t find a label for the exact name.